This summer we'll be watching our gas money, so I'm assembling summer supplies as cheap as I can! 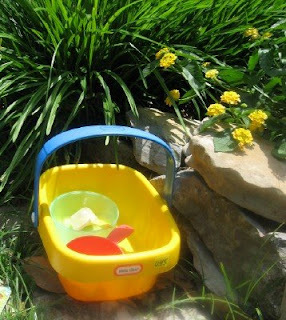 Keep water toys in the trunk for beach and pool trips. I bought this container for 45-cents, but you can also cut plastic milk cartons open for handled buckets. Toss in any lid-less Tupperware, odd scoops and spoons. Or trim 20-oz Coke bottles in half. Now you have a funnel and a cup! 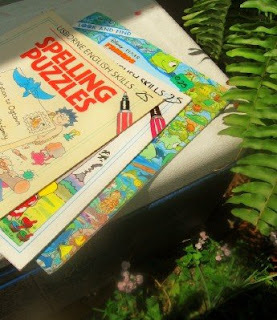 I like thin puzzle books. They don't take up room in cars and planes, and you can toss them at your destination. Flip through your thrift store's book section for a huge savings! These cost 25-cents, with very little writing from a previous owner. One of my favorite tips from the Tightwad Gazette was for blowing bubbles using food cans that were opened on both ends. This is a little harder to do with the stackable cans, but we still do it today, even though my daughter is 12. We use tomato paste and 28 ounce cans most of the time and get much bigger bubbles. Little children are fascinated by it! I do put duct tape around the can edges to avoid any cuts from sharp edges. P.S. I think it's great that you turned on comment moderation! As always, great suggestions, Meredith! Part of me is frsutrated over the gas issue but the other part is excited to find new ways to enjoy the summer without traveling far. Do you also have any fun at-home suggestions for your readers (and by "your readers", I mean ME! haha)? I save all kinds of food package items for the children's water and sand play. The sour cream and cottage cheese containers are good. So are the nice plastic juice concentrate containers from Welchel's juice. I always buy spoons and odd tupper ware containers at garage sales when I can get them for .10 or so. We also use the large buckets that laundry soap and dishwasher soap comes in. I look for kitchen items at thrift stores too. Like smaller pitchers and plastic cups. These make great toys. I also like to let the children use a little soap with their water. They love playing in the bubbles. Great ideas! I'm very concerned about the price of fuel and we are paring down our usual summer activities! We live only a quarter mile from a beautiful shallow and sandy river here in Nebraska so I think we will be taking more advantage of it this year! It's our landlocked version of the beach! Keep the ideas coming! I so love your blog! I always looked for pool floaties (new in the pkg), games, comic books, movies, - anything I could find in good shape - at yard sales. Even water shoes (for the river), kites, and balls for camping. I notice that a lot of frugal bloggers are mapping out journey planners every week. With gas so pricey I am going to make this a priority - it could mean some very real savings. I used to do a children's summer reading program for a local bookstore . I found it helpful to choose a theme for the summer. This might be fun for parents to have a different theme each summer , and then plan books and activities around your theme. This is also helpful for parents who are trying to stay away from the more commercial themes for children . For example ; a Starlight summer , study stars and constellations , make star maps , put glow in the dark stars on the ceiling , borrow or look for a used telescope, make star dust , sing star songs , visit a planetarium . That is just one of many fun things you could do with your children in the summer, and the library will have lots of great books that will tie in with your theme. Hopefully, your children will one day fondly remember their Star summer or Pirate summer. Have Fun !!! Great post!! :0) My kids are older then yours but I remember when they were younger and always having things ready. ;0) I also try to keep a container of things in my van, just to ready for various unexpected events. We got some kites from the dollar store that work surprisingly well! What does your husband eat for breakfast? Have you posted about that before? I'm looking for diabetic alternatives for my dh. One water activity my kids like to do is play with our sand and water table (found in a trash pile for free). Rather than put sand in it, though, I put water on one side and soapy water on the other. It makes less of a mess, is cheaper, and is lots of fun. I also have bought the gardener hand tool kit for $1 at Walmart (then kiddo and I both get to use it!) and kids gardening gloves for $1 as well. For two dollars, my then 4 year old was able to play gardener - she LOVED it and it was $2! And we still have them and the gloves still fit. We also like to keep a little homemade pack of fun too, chalk, bubbles, cookie cutters made from tuna fish cans, playdoh, watercolors (recipes can be found at my blog)... for rainy summer days. When my kids were younger, a neighbor would put out a bucket of water and some old paint brushes. They had a good time "painting" the back deck. Great tips! I think this is my first visit here. Where have I been? Great blog! One of the best things about buying books (Esp. the beach read) at thrift store is the lack of guilt when I leave them on a plane or toss them back in the goodwill bin. I also don't worry if I drop them in the tub on accident! When my sons were small we made summer scrapbooks - nothing fancy just construction paper stapled together. When we went out for the day or even to the park they would draw pictures, press flowers grasses and leaves - find pictures of the birds we saw etc. They are parents themselves now but we still have those scrapbooks. Frisbees are usually found every where. I don't understand why people get rid of them they are so much fun for the kids to play with. Hey they can even be used as shovels if need be. I have never commented before but I just wanted to say that when I found your blog, I went back and read every post. It is like a bright ray of sunshine. I have honestly caught myself at times wondering, "What would Meredith do?" I, too, have a diabetic husband and find the info you post about that helpful as well as the frugal homekeeping info. And your photography is amazing! Thanks for this beautiful little corner of the blogging world! Its not the same thing, as we don't plan on travelling this summer and I am thinking of cancelling our one planned far away trip if we can't 'train' there, but we've spent a bit of cash prepping ourselves to have a summer full of opportunities at home. To that end, we've bought a second hand, twice used, canoe and the stuff you need for canoing. We've set ourselves up with good bikes, lamps, helmets, etc, and a very generous yet easy to pull trailer for the bike. We even have a trailer so that we can bike our canoe to the water. I spent about $200 on yard play things like a volleyball/badminton set, lawn darts, ring toss, tether ball, bocci ball, baseball equipment, basketball equipment, a book on small ball games and the small balls, and more... It was a frugally spent $200. I thought that instead of spend the money on gas and travel places and not have anything to show for it, we'd spend the money and invest it in things that can bring us the same joy if we care for our things. My kids are 6 & 8. Oh, and we have a large sandbox for years... its currently 12 ft by 10 ft. I am looking forward with the tighter times ahead to spend more time with my children and doing simplier things like looking at bugs, going on nature walks on the mountain. Having little picnics outside. Making stick forts in the garden, mud pies,gardening as a family. I love to see what you get for so little! When I was a kid, we painted w/ water and a paintbrush like a previous poster. Another fun thing my grandmother did for us was to put dirt in a coffee can and grow grass seed. We would trim the grass in odd shapes, and it just kept growing. We were the envy of the neighborhood. I used to take old magazines and paste character pictures on to cardboard. Quick snips and we would have characters for all sorts of plays as they traveled. Now I am prepping for travel with my 8 month old grandson. Would love ideas for him!